Comedian Jake Sharon tries to find the negatives of guilt! 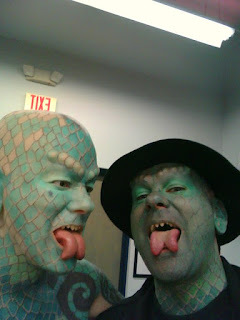 Our Sunshiny Friend is world renowned Lizardman, Erik Sprague! For a guy who transformed himself into a lizard, Erik is a surprisingly down to Earth guy. He''s in a band. He's a comedian. He's a married guy. Erik talks about his travels as a sideshow freak. He loves all the places showbiz takes him; Getting there is the real job. Jake shares A Crazy Thing You Can Do Instead Of Committing Suicide, Guilt Trip!